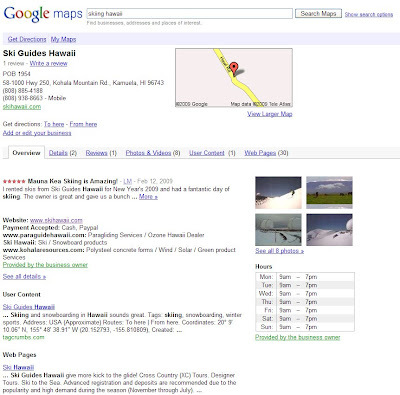 You also probably know how they tend to work: A potential customer does a search on Google.com or in Google Maps, comes across your listing, clicks on it to see your reviews and details, and then gets directions to your location. Now, imagine if there were a way for you to get a better understanding of how those customers are finding you. Did they search for "pizza" or "pasta" to get to the listing for your Italian restaurant? Do they live across town, but drive miles for your great selection of camping gear? What happens to traffic to your new dental practice when you start advertising in the local paper? With information like that, you'd be able to make better informed decisions on how to drive more traffic to your listing and attract more customers. When you sign in to the LBC today, you'll find that we've already populated the dashboards for claimed listings with data from the last 30 days. After that, new information will be added every day, so you can check in often to see how things are going. We're also working hard to add more historical information, and to make this available for businesses outside the U.S. All the data we share through the dashboard will be anonymous and aggregated, to protect the privacy of Google users. We're really excited to be able to open up this data to local business owners. Before now, you could track usage metrics on your website using a tool like Google Analytics, but data about how customers found you in other ways never got back to you. That all changes today, and we think business owners will really get a lot out of this new information. So if you're a local business owner and you feel the same way, be sure to check out this new dashboard. To learn more about accessing and using the dashboard, take a look at the video below and then visit the Lat Long Blog for a more in-depth overview.